As a parent, we all want our children to succeed in whatever they do. Throughout their education, you will want to know they are receiving the best level of teaching available. With a wide variety of subjects that your child needs to learn, there will be some they excel at more than others. If you have noticed that your child is struggling in the math department, it may be time to enlist some help. Hiring a tutor can be a great way to get your child back on track, helping them to succeed. 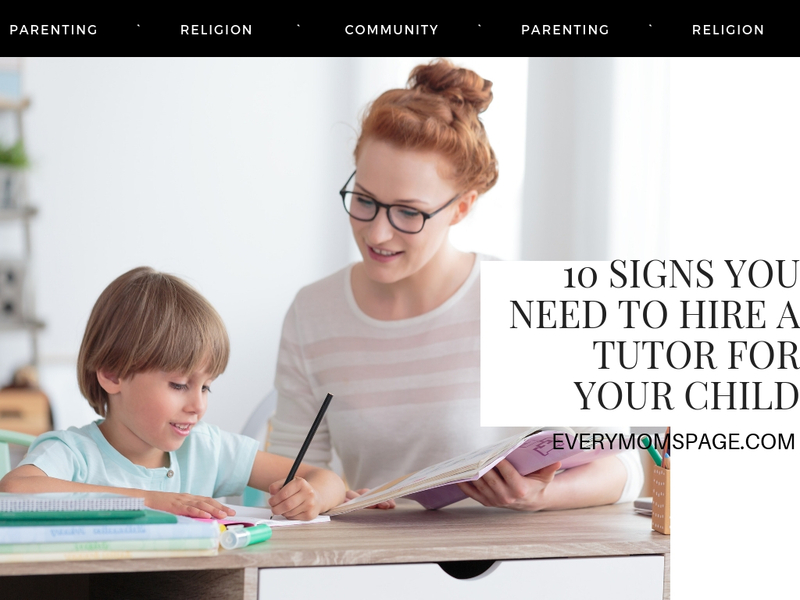 Here are 10 signs that you need to hire a tutor for your child. One of the main signs to look out for is if your child is getting low scores on class tests, quizzes, and assignments. With school grades tending to be averaged or cumulative, this means that the grades they earn early on are just as important as the grades they earn now. The quicker your child gets the help and support they need, the better chance they have of securing good grades. Make sure to contact your child’s school to check whether they offer a website that can monitor your child’s grades. This can be a fantastic way to keep a close eye on how your child is doing, helping you be in the know when it comes to their learning. With a wide range of subjects that students are expected to learn, it’s only natural that your child may do better in one over another. For example, if your child isn’t flourishing at math, you may want to consider hiring a math tutor to help get them up to speed. Learning skills and math knowledge can be beneficial for your child all the way through to adulthood. If you are concerned about how well your child is doing in school, you should consider hiring a tutor. If your child is doubting their ability to do well, this can cause all sorts of problems and make your child not want to go into school. Having a tutor on hand to assist them with their studies can make the world of difference and help improve your child’s confidence. Just like with low confidence, many kids suffer low self-esteem if they are not flourishing in their studies. With many children being eager to make their parents happy, they may not be able to communicate how they are feeling. Therefore, having a tutor who has your kids’ best interests at heart can help your child feel relaxed from the word go, giving them someone they can open up to about their worries and concerns. Not only will their feelings of self-worth improve, their skills and development will improve also. With the school curriculum being full of so much information, it can be hard for your kid to retain everything that is expected of them. While there are plenty of important skills that your child can learn at school, there are areas that many kids struggle with, such as problem-solving. Being able to problem solve can not only help them throughout their education, but in the work environment too, so hiring a tutor to teach your child about problem-solving can only be a good thing. Many kids have a short attention span, which means that their interest can soon diminish once they head into the classroom. If your child gets bored easily, having a tutor on hand can give your kid that extra layer of support to help them succeed with their education. As a parent, it’s important to be patient with your child. While you may be able to learn something within an instant, it may take your kid that little bit longer, so having a level of understanding and empathy is essential. If your child is transitioning between schools, it can cause disruption to their learning. Whether you’re moving home, or they are moving from middle school to high school, some children struggle with change. That’s why having regular tutoring outside the classroom can help your child adjust to their new surroundings. Not only is your child expected to learn content, but they will also be making new friends and going through stages such as puberty, which can be incredibly overwhelming, therefore, having extra help can go a long way in keeping your child happy and confident with their work. If your child is prone to being disorganized, their grades can be affected. Things such as loose papers lying around the home or if they don’t hand in homework are just some signs to look out for. While organizational skills is one of the main key skills that students need to succeed, it is not always taught in the classroom. A tutor can drill in the importance of being organized to your child, helping them stay on the right track. There are also various ways that you can help teach your kid to be organized too. When school is finished for the summer, it can be easy for your child to fall off the bandwagon. If you have concerns that your child will lose some of the motivation and ground they have gained over the past academic year, you may want to consider having a tutor come in over the summer. While your child may find the idea alarming, even having one or two hours a week of support while school is out can be a huge help. If your child struggles in the classroom, they may benefit more from using online tutoring. With many Kumon math tutors believing that center-based tutoring is not the best solution, you may want to consider online tutoring apps which can provide a wide range of benefits such as more personalized tutoring and live-time feedback for parents. Having a tutor on hand to provide support and guidance to your child can make a huge difference. If your child suffers from low self-esteem, the chances are they are unable to perform to the best of their ability when in the classroom. Therefore, hiring a tutor to provide one-on-one support can help your child achieve their objectives and goals.